RUSH: Tyler in Vancouver, Washington. Great to have you, sir. Hello. CALLER: Thank you so much! Hello! Oh, my gosh. I just started listening to you a number of years ago. I grew up listening to you because of my grandfather, and I am beyond thankful for that. I wanted to ask you a question. It comes from both him and I. He’s out of Bakersfield, California. We want to know… You know, in other countries when someone speaks out against the government… You touched on this in the first few minutes of your show yesterday, and I was so excited. But when someone speaks out against the government, they can be locked in jail. So I want to know what you think is gonna happen to people like you and the few others out there who have the guts to step up? CALLER: As time goes on, when we become more of a socialist country — because that’s the direction we’re heading towards — what do you think is gonna happen to media, to anyone who speaks out against the government? 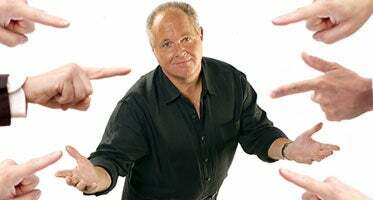 RUSH: Now, here’s the thing about that. We’re still at the stage, Tyler, where the average low-information person hearing somebody express that fear will be laughed at and thought to be ridiculous and paranoid and foolish. Yet, slowly but surely, we are creeping in that direction. If you take a look at the mayor of New York and the things that you are not permitted to do, the things you’re not permitted to eat, the size of things you’re not permitted to drink, the idea that government knows best and must protect you from yourself — and, by the way, protect itself from you — is something that’s creeping. He, in the story, has a conniption fit and blows his stack. He says, “Who do you think you are, denying me a second slice of pizza?” and so forth. It was to make a point about the way he is governing. Now, this is nothing new. People have always been uncomfortable hearing things that they don’t agree with or hearing things that they don’t want to hear per se. Political correctness is all about that. Political correctness is nothing more than the censorship of free speech — and, as you know, it’s rising. It’s not the government. Political correctness is happening within the bowels of our culture. It’s happening everywhere. It’s happening in schools and universities. It’s slowly permeating everything, and nobody can put their finger on it. You know, everybody speaks out against political correctness. It doesn’t have one advocate by name, there’s not one person who stands up and says they’re in favor of PC, but everybody’s scared to death of it. It has no advocates. We’re led to believe everybody opposes it and disagrees with it, but yet everybody’s scared to death of it. So who is it? Well, it’s the power structure wherever you happen to be. If you’re in college, it’s the classroom, the professor, the administration. If you’re at work, it’s the boss. In some places it can be the government, but mostly this happening within the bowels of our culture. Now, I know you ask about me specifically. Let me tell you how it’s gonna happen if ever it does. It isn’t gonna be the president, at least in my case. I know that if Obama could get rid of me, he would, and if he could shut me up he would. But we’re not to the point where he can, we’re not to the point where he can even try and get full-fledged support. Now, we may be trending that way. I think we’re a long, long way from that, but the trend can’t be denied. Yet it could happen in many other ways. I don’t want to detail them ’cause I don’t want to give people any ideas. Let me remind you that I’ve said something over the past couple of years. I’ve mentioned it here and there, now and then, very informally, but I’ll mention it again. I fully expected expect, down the road at some point — and not just me, but I fully expect — to be denounced and held up as the primary problem for either people that agree with me or believe what I believe or same party or what have you. I fully expect that. It’s just the nature of things. Everybody wants to blame somebody else for their problems and so forth. There’s always pressure on free speech. There’s always pressure on freedom of thought. There’s always, always societal or professional pressure. I’ve always been amazed at how people open themselves up to be offended. I’ve always been amazed how people give that much power away to other people. I’ve always been amazed at how words are so damaging. They’re just words! Whatever they are, whoever says them, they’re just words. ‘Cause they know where I’m going, or they think they know where I’m going. “Don’t say it! They’re gonna come after you! They’re gonna destroy you.” They’re very, very concerned because what they know is that there are people who would be really happy if this program didn’t exist. They think that they would have a much clearer road to what they want if the program didn’t exist. I know there are people laying in wait for that one thing they think I can’t recover from. They’ve thought they had me three or four times just in the last two years. They can’t wait. I, ladies and gentlemen, am fully aware of it. I know all of these things that are laying in wait. I know all the things. I know the people that are behind it and doing it and why they’re doing it and so forth. (sigh) It’s just a testament. I mean, there are reasons for it. Again, I’ve had to learn to accept that all that exists as a measure of my success. It was hard at first, but I finally have learned how. I did learn how to do it years ago. Now it’s gotten to the point where I have fun tweaking all these people, knowing full well what their reaction’s gonna be. I have fun tweaking the media, tweaking Obama, tweaking Republicans, whoever it is. But to get to your specific question in terms of thinking that one day I’m gonna wake up and Obama or somebody in government will have outlawed this program? Believe me, that’s not the way it’s gonna happen. It could, but there will be other people that get to me first before the government does, is my only point — some of them in radio, some of them in the Republican Party, some of them in the media — long before Obama does. RUSH: I was trying to tiptoe around this earlier, and I said, “What the hell am I tiptoeing for? Let me just explain it.” And you know it as well as I do, folks. I’ve even told you about it. The Republican Party can’t win presidential elections anymore — they don’t think they can, and there’s one reason why, in their minds: People like me and people like you. The Republican Party thinks that its big problems right now are people like Ted Cruz, Mike Lee, and Tea Party Republicans. They also think their big problem is conservative media people who are preventing the party from “modernizing.” People like me are keeping the party too conservative, and they can’t win being conservative. That’s what they think. This isn’t new. I’ve been talking about this for a number of years. You remember. I’ve told you. The Republican Party establishment never did really like Ronald Reagan. They’re embarrassed of pro-lifers and all this kind of thing. The only thing that I was trying to say when I was tiptoeing around with the guy earlier who called about this is that there are people who can’t win, and they’re not gonna blame themselves. They’re gonna look for scapegoats and excuses, and they’re gonna point fingers at me and people like Ted Cruz and others — other people on talk radio and so forth — as the scapegoat, as the cop-out reason. It’s gonna happen. It already does, now and then. But it’s just the way of the world.